BasurArte: Starting with an exhibition…. Usually we celebrate the end of a workshop with an exhibition or showing of some sort with a collection of our artwork…this time though we flipped it up a bit. Since, a large part of Plasticolandia is about considering and exploring our consumption, paying attention to the current problems we have with waste AND with creating stronger ties to our community, we did two introductory two-week long projects that culminated with an art show at a local restaurant. Two volunteers from the Muskoka Foundation joined our forces to put this whole crazy thing on. 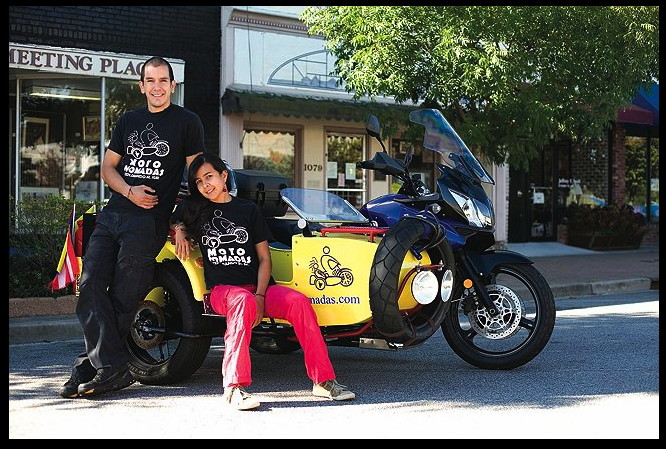 Ileana and Efrain, an inspiring couple that are traveling across Mexico and then through central America in their motorcycle (equipt with side-car), staying with and volunteering for a number of communities and organizations. Check out their website to learn more about them and their efforts, www.motonomadas.com. Together the three of us and the oldest group of girls set off to complete to art projects that focused on and actually utilized waste items. We started by having a group discussion to find out what our current knowledge base of the subject actually was. We discovered that we all agreed their were many problems that we could examine, but most of them stemmed from a contrast between how the city looks and is treated in touristic areas verses the areas that are solely occupied by residents. We broke up in to groups to hit the streets and document the three main issues they agreed upon being the most important to call attention to. With cameras in hand, thanks to the Muskoka Foundation, the girls spent a couple hours walking through the streets and the callejones creating images that they thought conveyed these issues. The next class, we turned to using the problem to create something new. I shared a video I had seen about a year ago on YouTube that shows you how to transform grocery bags into a messenger bag. After watching the “how-to”, I asked them to brainstorm of possible landscapes or symbols to represent Guanajuato. Each girl sketched her idea and then picked out the plastic bags in the colors that she needed to create her image. Using this process, with wax paper and an iron, we drew and cut our designs and then fused them into their final form. Perhaps my favorite part of this project is that the girls ended up having no school on the friday of that week. This meant that they went home early for the weekend. However, as we were finalizing the landscapes, several of the girls had begun the process of stitching in the details. I threw out the idea of meeting on Friday during the afternoon to finish the sewing process. ALL of the girls wanted to join us. So we made a date and most of them were given permission by their parents to meet us in the park. The afternoon spent sewing and chatting in the park was by far one of the most delightful classes that I have had with this group of girls. 29 Mar	This entry was published on March 29, 2011 at 5:42 am and is filed under Muskoka Volunteer Projects, Uncategorized. Bookmark the permalink. Follow any comments here with the RSS feed for this post.